← What is Clegg doing? The answer is Mandelson! The financial crisis of the past couple of years has shocked the world. House prices collapsed and jobs were axed. Yet, now in 2010 we are told that the worst is over and growth is back again. House prices in the UK are growing again at over 10% a year, according to some market analysts, and the economy is officially growing once again. But are we just going to fall into the same trap of debt and chasing ephemeral growth to hit political targets? Is there another way? 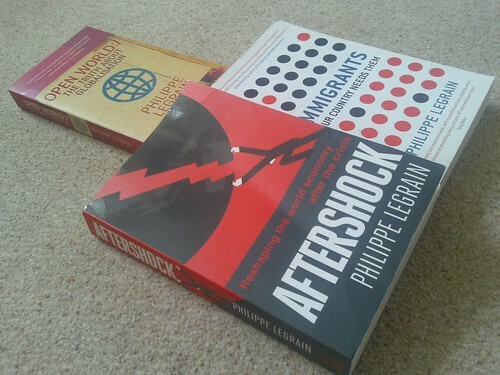 Well, Philippe Legrain has jetted around the world to look at different systems and ideas and he has produced a new book explaining his views on where we should go next – ‘Aftershock’. This entry was posted in Uncategorized and tagged Aftershock, book, book launch, event, London School Economics, LSE, party, philippe legrain. Bookmark the permalink.